Wallonian Brewer Garners International Recognition for Beers and Brewery. Le Roeulx, Belgium (October 30, 2017) – St-Feuillien has been generating a lot of international press recently, taking home two medals at the 2017 World Beer Awards, and being named a Top Belgian Brewery to Visit by CNN. 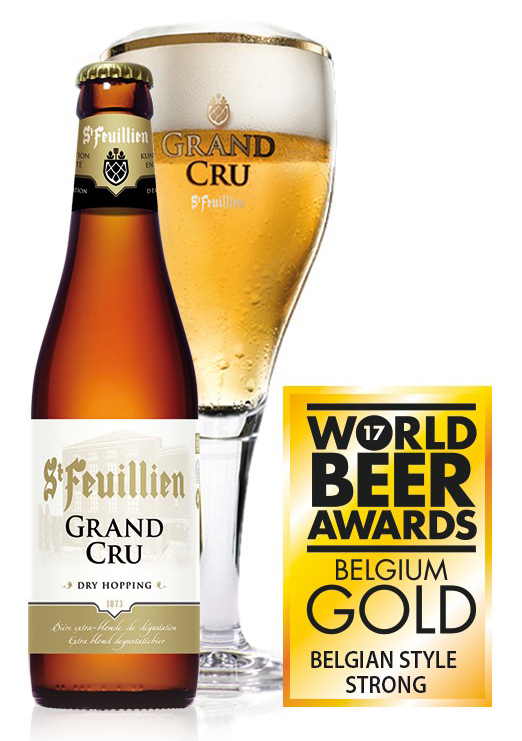 The London-based competition saw an international jury of experts, who blind-tasted over 1,500 beers from 32 countries award St-Feuillien Grand Cru a gold medal in the “Pale Beer – Belgian Style Strong” category, and a silver in the “Pale Beer – IPA” category for its Belgian Coast IPA. The world-famous Grand Cru boasts a delicate nose of subtle hops and fruit over a backdrop of honey-like malt with a dry, distinguished mouthfeel and wonderful fruity and toasty character. The relative newcomer Belgian Coast is a light drinking, golden ale with subtle hints of citrus and a firm, white head boasting seven intermingled hop aromas. A combination of Belgian and American brewing traditions, it marries the intensity of American IPA with the subtle balance of European brewing nuance. According to CNN, Brasserie St-Feuillien is just as notable as its beers, having recently been named one of Belgium’s top breweries to visit. The small town of Le Roeulx, where Brasserie St-Feuillien is located, boasts large historical and cultural significance, including the 335-foot-high funicular boatlift of Strépy-Thieu – a UNESCO World Heritage Site. Visits to Brasserie St-Feuillien can be made without reservation every Saturday at 2 p.m. and Sunday at 10:30 a.m. Admission is seven euros. Interested in selling these award-winning beers at your restaurant, bar or retail store? Interested in becoming a distribution partner for St-Feuillien? Please contact Lanny Hoff for details. For interview opportunities with St-Feuillien, or for more information, please contact Lanny Hoff at +1 (612) 245-5433 or by email at lanny.hoff@artisanalimports.com.